Package includes: Grip Strut® Grating cut to length if required, four 9/16” dia. holes staggered in each corner of up-turned kickplate, two 8-hole 12 ga. 4-1/2” x 30” C-channel splice plates with 16 ea. 1/2” x 1-1/4” hex head cap screws (galv. S.A.E. Grade 5, lightly oiled), washers and hex nuts. Kit joins continuous sections together in run over clear spans to act as one continuous unit. Any combination of 12 and 10 ft. planks can be joined with splice plate package. Recommended bolt torque: 72 ft/lb min. 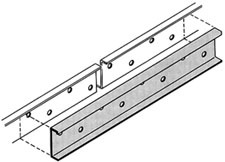 Package includes: Grip Strut® Grating cut to length if required, four 1/2” dia. holes in each corner of up-turned kickplate, two 8-hole 10 ga. 4” x 7” splice plates with 16 ea. 7/16” x 1-1/4” bolts, washers, and hex nuts. Kit joins continuous sections together in a run only over supports. Recommended bolt torque: 55 ft/lb min.